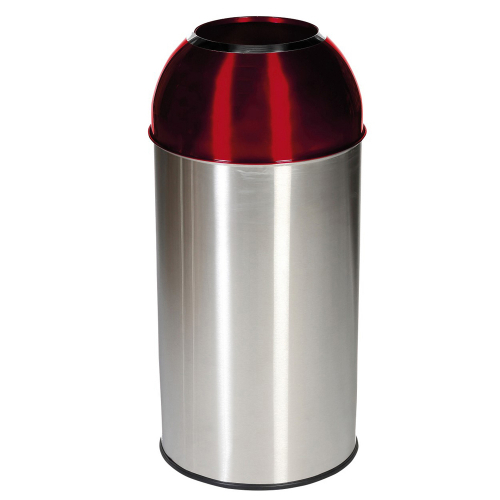 This high-quality bin features a stainless-steel body and a brightly coloured steel dome which makes it ideally situated in high-traffic environments such as receptions, offices, business premises and schools. Available in a choice of 5 different dome colours, this eye-catching bin can assist waste and recycling separation by assigning different waste streams to each coloured dome. The open top design of the bin ensures that waste is easily disposed of, whilst the domed shape discourages unwanted behaviour, such as sitting or climbing on the bin. The base of the bin features a rubber rim in order to help prevent scratches and scuffs to the floor or surface beneath the bin, and each bin comes complete with a galvanised metal liner.